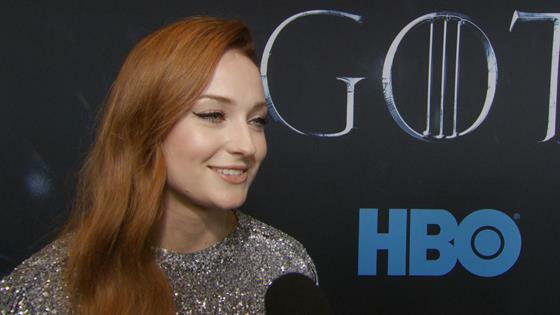 Will Sophie Turner Watch "GoT" With Boyfriend Joe Jonas? Earlier today, Joe Jonas and 21-year-old Game of Thrones star Sophie Turner announced their engagement. Both took to Instagram to post the happy news, showing photos of the actress wearing a pear-shaped diamond engagement ring and tagging each other in the pics. A source confirmed the engagement to E! News. The actress and the DNCE singer have been dating since at least November 2016, but have kept things very quiet about their high-profile relationship. While the twosome have been spotted out and about on a slew of occasions, the duo has yet to do a red carpet together and are all but absent from each other's social media pages, save for today's big announcement (and one post from the GoT star last January). Previously the singer dated Taylor Swift, AJ Michalka, Demi Lovato, Camilla Belle, Ashley Greene and Gigi Hadid. Meanwhile, Sophie talked to Marie Claire UK in July about how happy she was with Joe, but said there were some issues being under the microscope. "You do feel like you're living in a fishbowl," she said. "It's frustrating [that] it's the most mundane things that make the news—how boring!" Today's news was anything but boring! The duo held hands in Miami back in Dec. 2016. Letting the cat out of the bag, the pair got cozy at a Kings of Leon concert in November 2016. The first time the pair were spotted together was here—in November 2016. The lovebirds were spotted arriving to CAA's Golden Globes party at Catch LA in Dec. 2016. Wearing workout clothes, the two held hands while taking a romantic stroll in the East Village neighborhood of NYC. In January 2017, the hot couple left a People Choice Awards after party hosted by DNCE. The pair left hand-in-hand and then got into a car together. The duo locked arms after a dinner date night at Craig's Restaurant in West Hollywood. The singer was seen taking a romantic stroll with his girlfriend, who was wearing a New Kids on the Block shirt, through the SoHo district of New York City on April 13, 2017. Joe was spotted writing on his hands courtesy of his new lady, some of which read "Joe gives me da good good." The pair were spotted at LAX on March 5, 2017 in Los Angeles, CA. The pair were photographed while out on the town in NYC in May. Rocking denim-on-denim looks, Joe and Sophie walked it out in the SoHo neighborhood of NYC on May 3, 2017. The duo walked arm in arm as they took a stroll through Venice, CA. Joe looked like quite the tourist, carrying a small camera and taking photos around town. Joe and Sophie picked a local restaurant to have lunch on the patio to bring their weekend to a end. The twosome walk their dog on September 7, 2017 in New York City. The two make out at the 2018 U.S. Open.